One of these days I'm gonna start crap like this personal. For a second, I thought Durango was talking about me: "I don’t know about big fat guys that don’t speak well..."
It is lighting every time and will now go into my regular use. Thanks for the guidance and info. This is my Nimrod...it is taller and thicker than my Zippo. The Zippo is a standard. The Zippo may be a smidge wider, but over all it is a smaller lighter...just by a little but noticeably smaller. It also goes to familiarity. I have been using the Zippo for most of my adult life. The Nimrod came to me just last year. OK...I am still having an issue with my Nimrod...yup the one in the pics above. I fill it up and its good for 12 to 15 or so lights and then it won't light. There is plenty of spark and if I put more fluid in (its really swimming with fluid) then it will light a dozen or so more times and then it stops. Is there a way to replace the wick? or are there replacement wicks? It holds fluid for an insane long time, but unless its dripping fuel, it won't light. Cool I'll do that tonight. My wife has a late meeting and it will be pipe and lighter bench time for me. If trimming the wick doesn't work, let it dry out and take all of the cotton "stuffing" out. It's not unusual with an old lighter to have seen so much use that there is precious little wick left and it's time for a replacement. Sometimes a lighter that's sat for decades ends up with a punky wick, too. If it needs a replacement, you won't be able to get nimrod wicks any more and you'll need to go online and look for the Ronson wicks with the guide needle. They fit, but they're no longer made and can be found sometimes on Amazon and sometimes on eBay. I had luck once calling a local tobacconist to see if he had any in the back, too. Good luck. You can train a monkey to fix a lighter or I'd never know any of this. By the way, I just got another Zippo. I thought I lost the one I leave at school; so,I ordered one of the “retro” 30s look versions with a pipe lighter insert. If you’re a, “I like to keep my rims from charring,” nutcase like me, these Zippos are hard to beat. Oh. I found the lost lighter. Now, I can leave one in the car. In m experience, the easiest way to find a lost lighter is to buy a new one. Never fails. Sort of like washing your car to make it rain. Works every time. Especially so if you live on a dirt road. Update on the Nimrod. I trimmed the wick...no joy...used my bodkin and perforated the wick from the sides, I then perforated the cotton and then perforated the wick from the top down into the cotton. And we had fire twice then no joy. I did a better job of trimming the wick and another shot with the bodkin on the center of the wick and...Now its lighting every time. I think this lighter was little used, plenty of wick, and then just sat in a desk drawer for years and years. I will keep using it and hopefully get it to where it is reliable. Thanks UB and Hugo. Glad you've got it working BH. Tangent: I always found it interesting how the word nimrod evolved to mean two such different things. 1. literary: a skillful hunter. 2. NORTH AMERICAN informal: an inept person. 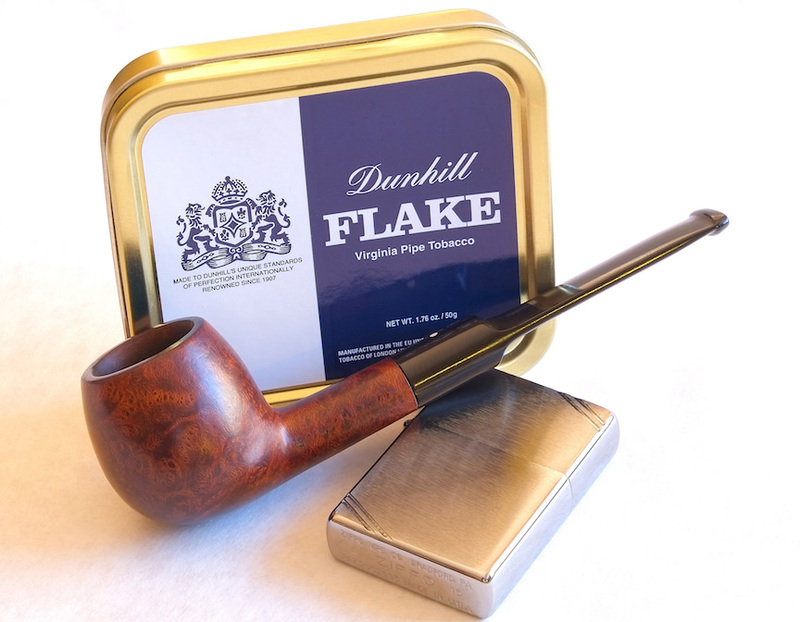 I just had my camera out for something else - decided to make better photo of the Dunhill one very generous CPSer gave me while the camera was handy, and used the new "Old" Zippo as a prop. They call this model, "Retro." It is the same shape and corner details as the lighters they sold in the 30s - sort of "Deco." I like it better than the current shape. This one came with a pipe lighter insert and cost around $15. My lighters (except for a Bic around here somewhere). 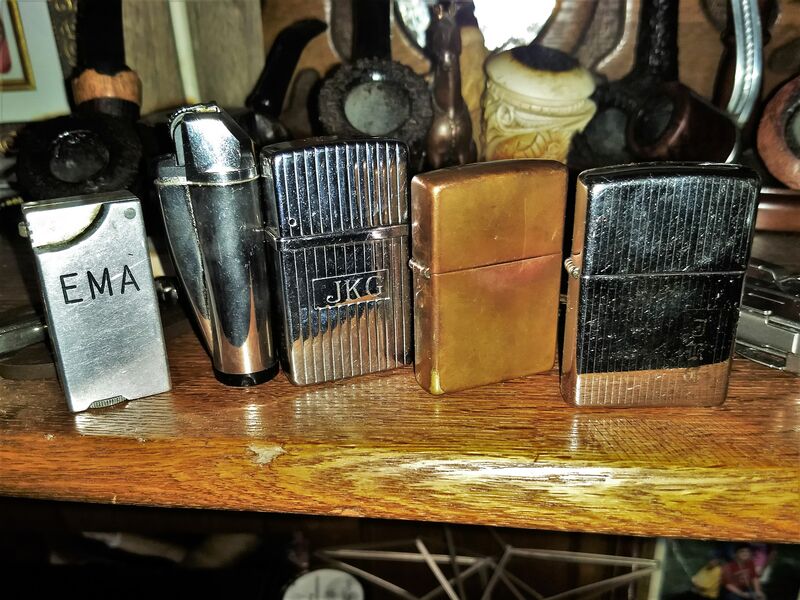 Left to Right: My great-uncle's Derby Aluminum Block lighter probably from when he returned from WWII. An IMCO that sees a lot of use; I bought this lighter on a trip at a pipe shop out of new-old-stock when I found myself lighterless. Too bad they don't make these anymore. My trusty Nimrod Admiral that also sees a lot of regular use. A copper plated Zippo I bought in the early Nineties; I love this style as it reminds me of all the copper plumbing I did with my Daddy when I was a kid. A nicer engraved Zippo Beth and the boys bought me for my birthday a few years back. I used the Zippos a lot until the Nimrod proved to outperform them so much regarding frequency of fuel refills. Of course, on occasion, I will carry strike anywhere matches in one of my match safes instead. Yes, very nice. My dad had an old Nimrod pipe lighter that I wish I could locate. Steve, where did you pick up the zippo + insert for $15? I am content with my Bic disposables.